Here I will tell you the story of how it all began in Alaska, on the Howling Dog Farm, as it was known then, before and after Earl and Natalie Norris moved to Willow. Here is where it all started, in their self-built log cabin just outside Anchorage. 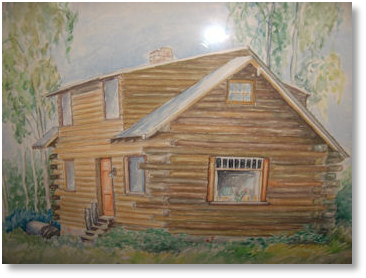 This painting of the cabin, by Fiep Bollee, was made from a photo I took in the 1960’s - now lost. Below are links to further pages with information I gathered over the years from my contacts and visits to the Howling Dog Farm. The Anadyr Dogs - important dogs of the Anadyr history. The Willow Years - Anadyr teams, stories and memories. Exports to Europe - the dogs that founded the European sled-dog and breeding programs. Iditarod Memories - the Anadyr teams that ran in the Iditarod race. Natalie and Earl Norris talking about growing up with dogs, coming to Alaska to work and the growth of dog mushing in Alaska.